Rachael has been involved in the Early Childhood Care and Education sector for almost 10 years, within a variety of disciplines. She began her career in Childcare, having qualified from Mary Immaculate College (MIC), Limerick with a BA in ECCE, graduating in 2009. She has almost 8 years’ experience working in childcare in a supervisory role and predominantly within the preschool age group. While working in Childcare Rachael was successful in completing a part-time Diploma in Child Psychology. Rachael’s career in teaching began in 2013, as she combined her passion for childcare and her love for teaching. Rachael started working in the PLC sector delivering on level 5 & 6 ECCE programmes, with a specific focus on practical teaching components where she could share her experience and knowledge with current students. 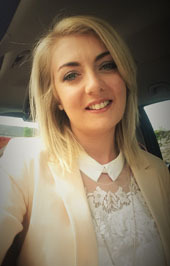 Rachael’s love for teaching in a subject manner which she is passionate about motivated her to complete a Post Graduate Diploma in Teaching in Further Educations from Waterford Institute of Technology (WIT) in 2015. Continued Professional Development is an integral part of Rachael’s career path and it has driven her to participate in a variety of additional workshops and training opportunities. The most significant was notably her participation on a study visit to Norway, funded by Early Childhood Ireland & Leargas in partnership with Queen Maud University, Trondheim, Norway. Rachael has guest lectured with Limerick Institute of Technology (LIT), with specific focus on child development and theorists of child development. Currently Rachael is working with Mary Immaculate as the Cork based tutor on the Leadership for Inclusion programme, which began in 2016. Concurrently she is leading and delivering Early Childhood Care and Education programme with the BTEI, in South Tipperary. Rachael’s particular areas of interest are in Child Development, Reflective Practice & CPD as an integral part to working with children.